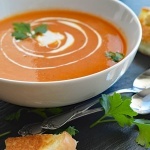 Fall is in the air and today, I’m making my favorite Homemade Vegan Cream of Tomato Soup! 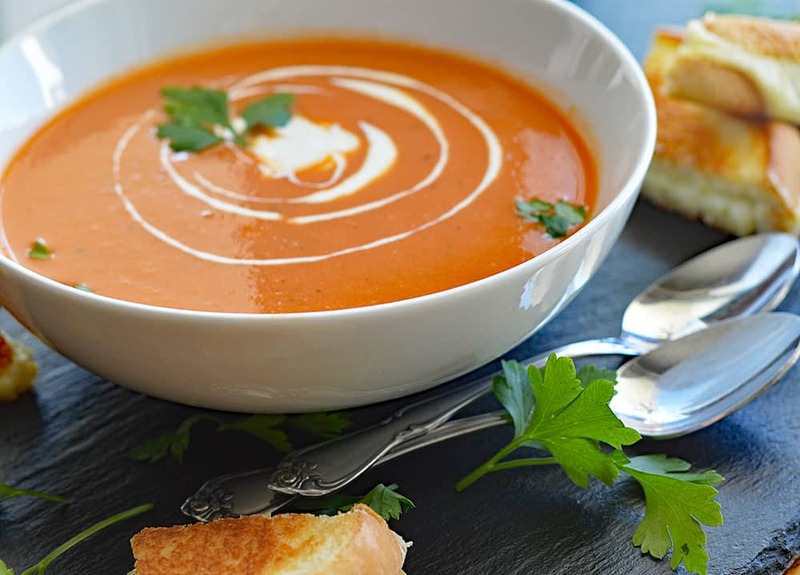 This velvety soup is perfect for any time of year, but especially now that the seasons are changing. It’s such a comforting classic. I found the Silk® Unsweetened Almondmilk at my local Scottsdale, AZ Walmart in the dairy section. Just look for that blue half gallon container with a yellow tag that says “NEW Silky Smooth Taste You’ll Love.” I also picked up that Silk® Light Original Almondmilk half gallon which I use for a variety of recipes throughout the week. So let’s get started on our Homemade Vegan Cream of Tomato Soup, shall we? The first step is to saute onions and garlic in a bit of oil and/or vegan margarine. I use both. You’ll notice I left my garlic clove whole for a bit of flavor, but my family members are not a fan and I remove it before adding flour. You can of course, mince yours. It will get pureed in the end and add a nice flavor. Once the onions are translucent, add the flour and cook for 1 minute. Since there are so few ingredients in this soup, it’s important to get the most bang for your buck with a rich, dark vegetable broth. I always use low sodium so that I can control my own salt. Next up are our whole canned tomatoes, a bit of sugar to counteract the acidity and a pinch of salt and pepper, to taste. Allow to simmer, covered, for about 20 minutes or so stirring occasionally. Be sure the tomato mixture is cool before attempting to blend it (heat expands in the processor) or it will end up on your ceiling … or all over YOU. It isn’t worth the rush to burn yourself or deal with that mess. 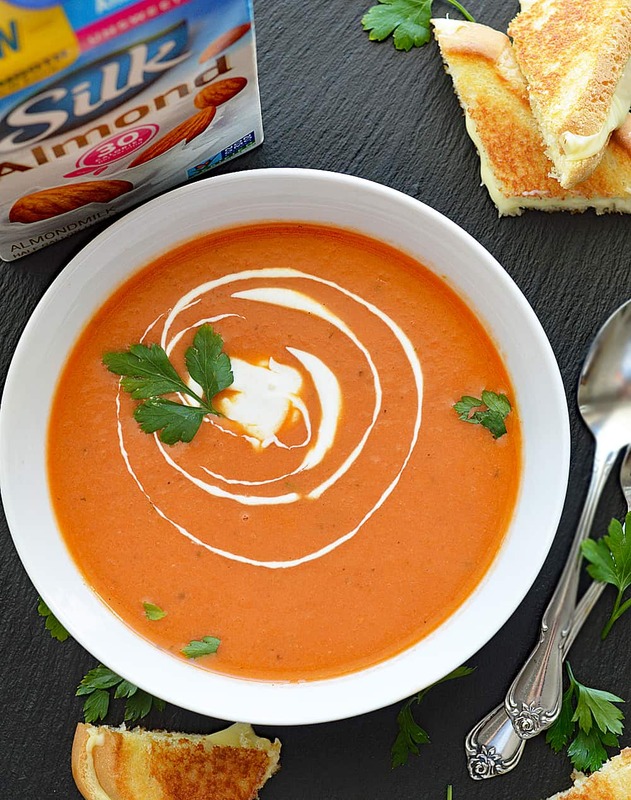 After it’s completely pureed, add the Silk® Unsweetened Almondmilk. You can either add it straight to the food processor (or blender), but I like to reheat the soup at this point and add it to a saucepan. 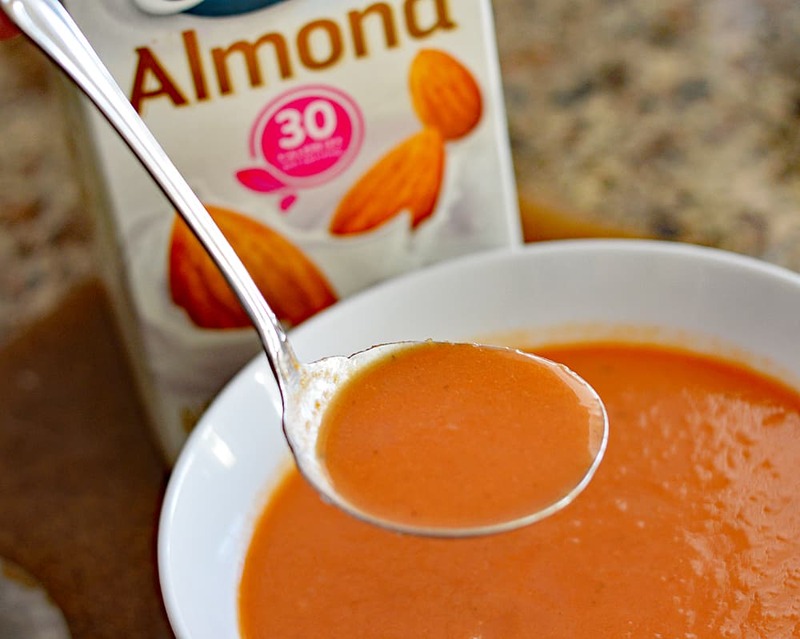 If you wanted to freeze this soup, stop right here before adding the almond milk. You can add it when you are reheating. What goes better with tomato soup than a vegan grilled cheese sandwich? Nothing! I am using a vegan mozzarella-style cheese and vegan margarine. …and add a dollop of vegan sour cream, if desired. 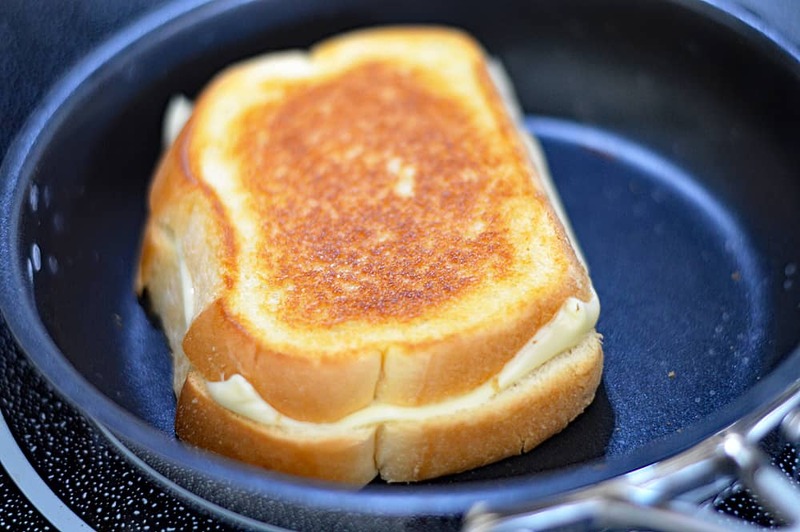 Garnish with fresh parsley and serve with your grilled cheese triangles. No matter how old I get, it’s still my favorite way to enjoy my Homemade Vegan Cream of Tomato Soup. 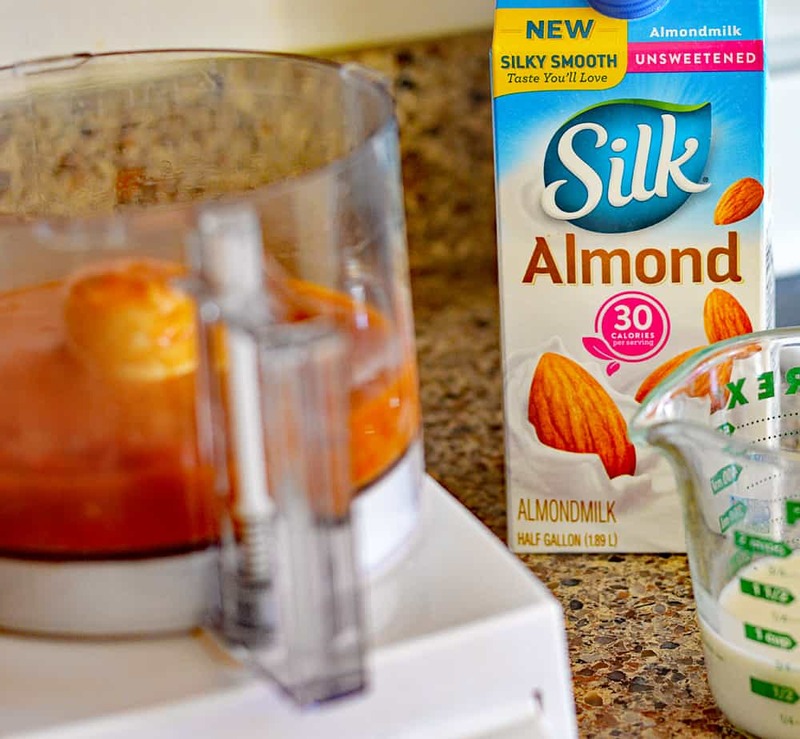 Have you tried the new reformulated Silk® Unsweetened Almondmilk? I just think it’s perfect to use in your favorite holiday (or everyday) recipe. I’m using it in everything from smoothies to soups, creamy pastas…you name it! In a large pan, heat the oil and margarine over medium heat, adding the onion and garlic. Cook, stirring occasionally, until the onions are soft and translucent. Add the flour and stir to coat the onion and garlic. Cook for 1 minute. Add the broth, tomatoes, sugar, salt and pepper. Simmer over medium-high heat while stirring the mixture to make sure that the flour is not sticking. Let cool briefly (do not puree HOT) and then process in batches in a blender or food processor. Taste and re-season with salt and pepper. Reheat the soup and add the SILK Unsweetened Almondmilk. Serve with vegan sour cream and a garnish of fresh parsley. I was cooking for a large group (13), so I quadrupled it, and it scaled up perfectly! I used 28 oz. cans of San Marzano Tomatoes, and my immersion blender. We served the soup with vegan rosemary/olive oil sourdough + mozzarella paninis, and there were no sandwiches or soup left. Thank you very much for such a splendid recipe! Filled them with Flow Your Heart Mozarella Cheese, and voila: instant dipping sandwiches!